After our friends Steve and Dawn returned to Toronto, it was time for us to look south. Time to leave Chicken Harbour, the other name for Georgetown. The reason for this nickname is that sailors become very comfortable in the secure anchorage that Georgetown offers. So when it’s time to leave, boats are confronted with long distances plus the swells from the Atlantic Ocean. All the things you haven’t been used to at an anchorage and it can be a bit intimidating for some. You can become a little “chicken” and struggle leaving something safe. That’s an odd but true phenomena. After doing our provisioning for the next month we up-anchored and staged our departure from Fowl Cay. This means we anchored in a place that gave us easy access to the Atlantic Ocean so we didn’t have to spend 2 hours just getting to the Atlantic before we could cover big distances. Georgetown to Conception Island As usual, we had an early morning departure, 6:30am, but this time we were with our buddy boat s.v. Delilah, with friends, Jill and Dean on board. Delilah is a 37 foot Tayana sailboat. She is very similar to Amanzi, so our boatspeed is about the same. That’s very helpful as a buddy boat, because you don’t necessarily want to travel with someone who is a great deal faster or slower than you. Going through the cut to get to the ocean, we hoisted our sails then threaded our way through the coral heads and were greeted by a wonderful 15 – 17 knot breeze on the ocean. Happily, for the first 5 hours we were able to sail toward our NE (northeastern )destination, Conception Cay. Unfortunately, the wind strength and wind direction did not hold, so we had to turn on the engine and motor-sail the rest of the way for 5 hours. But, all in all, we were happy to be out there again. By 4:30, we had covered the 45 nautical miles to Conception Island, an uninhabited island that is soon to part of the Bahamas Land and Sea Park. To our surprise, we were in the company of 12 other boats at this peaceful anchorage. In front of us, was this low island with its beautiful 1.5 km white sandy beach along its western shore. It was a great place to anchor in a northeast wind. And as soon as we dropped the hook (anchor) and lowered the dinghy into the water, we were welcomed by a BIG Barricuda. It seems to be something we see frequently. As you can imagine, neither one of us jumped in the water to check the anchor with our snorkel gear right away. On Wednesday, the next day, with the winds swinging around to the SE (southeast) we decided to stay put and take advantage of the wonderful diving off the reefs around the island. Armed with my spear and newly purchased weight belt and shark knife, I first tried my hand at fishing with friends Dan (s.v. Quixotic) and John (s.v. Savey) on one of the reefs south of the anchorage. With no luck, I was determined to try again later. In the afternoon, I went out with Dean from s.v. Delilah. We went to a different reef and Lady luck was on our side. After nearly an hour of diving and searching the reef, Dean spotted 1 huge Spiny Lobster out in the open sitting on the sandy bottom. 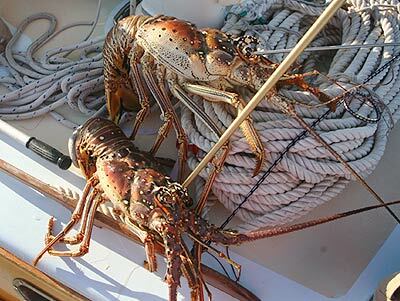 The lobster was sitting in 3.5 – 4 m of water. Having skin dived since I was a teenager in South Africa, this was the first time I attempted to spear a lobster. Now I just had to get close enough to try my luck. With Dean waiting on the surface and pointing the prey out to me, I made my first attempt at spearing but missed. The spear ricocheted off its back. The Lobster then scurried under a coral rock and Dean joined in the pursuit. He flushed him out of his hidey hole and gave me a second opportunity. This time, I did not miss. As I swam quickly back to the dinghy with lobster in hand, unbeknownst to me, Dean spotted a second Lobster out in the open. Dean successfully speared his prey but struggled to swim back to the dinghy. After several long minutes, he dropped the huge Lobster into the boat. Neither of us could believe our luck! We knew the girls would be happy with our hunt. What a feast we had – grilled Lobster with mashed potatoes and salad. Who could ask for more? Having heard a great weather report from Chris Parker of the Caribbean weather network for the next two days, both boats set off at first light together. The wind was light and a bit too close an angle to use our gib (our front sail) but the main steadied and helped us long. Once we’d skirted Rum Cay, 15 nm to the SE of Conception Island, we headed out to the east waiting for the predicted winds from the north east to fill in. Wind direction is always given as the direction from which it comes. As the north eastly winds filled in the afternoon, we tacked over and headed directly toward Mayagauna, our next destination over 120 nautical miles southeast. With our Cape Horn autopilot doing all the steering work, I focused on fishing. One of the tips we had picked up from more experienced fishermen in Georgetown was if you are not having any luck with one type of lure in half an hour pull it in and change it for something else. So, we tried this. It was late afternoon when the fishing reel gave a loud whizz. Kim was near the helm and I was down below. We looked at each other and knew we had caught something big. When we looked back behind the boat where the line was trailing, we saw a large fish leap out of the water. I scrambled for the rod. With the rod fully curved, the reel was still whizzing loudly as the fish fought to get away. Kim jumped into action as well, disengaging the autopilot and slowing the boat down. Soon, the fish began to slow down and I was able to begin to reel it in. Every now and again our fighter would jump clear out of the water shaking his head trying to shake the hook loose. We were awe struck by its pure physical strength. The fish’s colour was incredible – it was like watching a flourescent lime green torpedo come out of the water. Kim managed to radio our buddy boat who slowly came up behind us and watched the struggle. After 30 long minutes, I managed to bring the fish along side the boat. 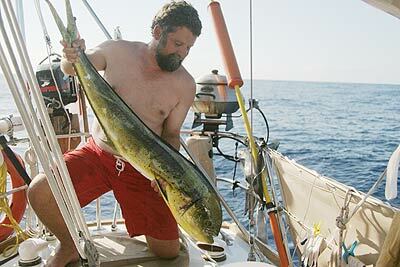 We had hooked a 1.5 m Mahi Mahi, also locally called Dolphin or Dorado. These fish are incredibly strong swimmers that are found in all the world’s warm waters. In the first year of their lives they swim in large schools of over a hundred but once they reach maturity they tend to congregate in pods of one or two bulls with 4-5 females. We had hooked a bull. Hooking a fish is one thing, but getting it aboard is quite another, particularly a large 40 pounder like this. Our gaff hook (a sharp hook to help land a fish) was rather short (about 30 cm) so in all the excitement and chaos Kim was running around trying to figure out how to attach the gaff hook to our boat hook. Being from Canada, you can imagine what the final solution we turned to when all else failed… duct tape. With the hook taped onto to the pole. Kim was able to gaff the fish. Then together we lifted it onto the stern of the boat. The fish was quite magnificent, a luminescent green colour. In an odd way, we had a mixture of feelings about the catch – sad to cause the demise of such a beautiful animal, but satisfied that it would provide us with a week’s worth of food. It took the next 1:30 hours to clean the fish and portion it in zip lock bags. Because we didn’t have much freezer space aboard Amanzi we radioed Delilah to store most of the fish in their freezer. With both boats side-by-side, we lowered our glorious treasure into their trailing dinghy. What a satisfied feeling for everyone. (This one’s for you Hammie and Glenys). Cleaning up the boat after such a catch took at least an hour. By this stage, darkness was approaching. We had over 100 miles to go to our destination, Mayaguana. It was truly a wonderful night for a sail, with the wind on the beam and the seas settled. Friends on other boats who we knew were behind us, were finally within sight. We had s.v. Eira, m.v Dreamweaver and s.v. Savey in our little flotilla all heading toward Mayagauna. Having company with other boats while sailing at night is very comforting as there are others to talk to and check in with if there is anything of concern. On this passage, we had two encounters with ships. The first, a cruiseline ship and the other a tugboat towing a very large barge. In both cases, I was able to talk directly to the vessels and make sure they saw all of our smaller vessels on their radar. With this communication, there was no fear of collision. Thirty hours after leaving Conception Island, we all motored into Abraham’s Bay on Mayagauna, SE Bahamas. Everyone felt a little more tired but truly satisfied with the safe trip and better yet with freezers full of fresh fish.